MTT is developing recuperated micro turbines up to 30 kW electrical power for CHP and other applications. The primary objective is to reduce production costs towards competitive levels. This can only be realized using off-the-shelf technologies for large volume production. Automotive turbocharger performance and efficiency have increased significantly during recent years, even for very small sizes. 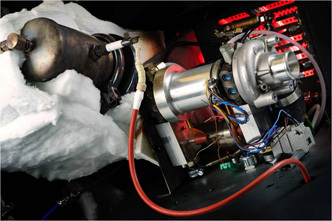 This has created an opportunity to develop low-cost micro turbines that can be produced in large volumes at low prices. Coupled with a generator electric power can be produced. By adding a recuperator, a large portion of the exhaust gas heat is recovered and electrical efficiency can be substantially increased.With low cost configurations, 16% electrical efficiency can be realized offering an excellent solution for a micro CHP application. With more advanced versions, levels up to 25% can be realized opening a wide variety of additional applications. MTT’s micro turbines surpass competitors in output efficiency, costs and environmental performance. While natural gas is the initial fuel of choice for the domestic micro CHP application, liquid fuels such as heating oil or diesel are required at locations without access to a natural gas distribution grid. A separate development program has been started for development of a clean combustor for liquid fuels that will comply with future emission requirements. The liquid fuel option also opens many other application areas for MTT micro turbines. Future development work will involve cost reduction programs that will be conducted to further reduce unit costs of the current micro CHP system design while maintaining performance and efficiency. In addition, advanced designs will be developed including micro turbines with improved efficiencies of compressor, turbine and recuperator and also higher cycle pressure ratio, resulting in significantly higher electric efficiency levels. This work is performed in collaboration with MTT’s technology partners TU Delft, TU Eindhoven, TNO and National Aerospace Laboratory NLR.